Photo courtesy of Jan Van Raay at Flickr.com. Synthetic fertilizer is made from petroleum and it poses a triple threat to the environment. When oil is extracted, processed, and transported, it produces greenhouse gases. Synthetic fertilizer also is unstable and will release additional gasses as it breaks down. Finally, synthetic fertilizer washes away when it rains, contaminating rivers, lakes, and bays with nutrients that can cause algal blooms. 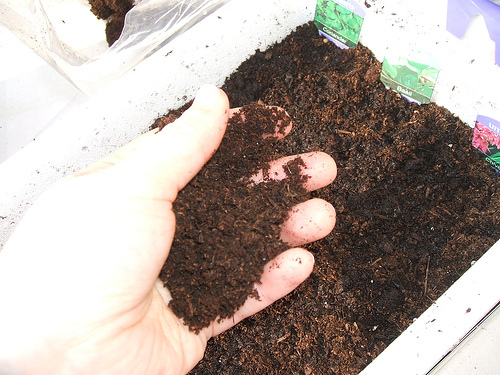 Instead of using synthetic fertilizer, you can improve the health of your garden with home made compost. There are plenty of ways to make earth friendly fertilizer by composting your food scraps, and doing so also cuts down on the amount of gas that the garbage truck burns. Instead of throwing valuable nutrients into the landfill, change your habits and save a few bucks too! Compost can be made in several different ways. You can use a compost pile, compost trenches, a composter, or a worm bin. Each of these methods produces humus that can be used around the yard. Humus is well balanced soil that contains an ideal mix of nutrients, retains water better than depleted topsoil, and has a rich, healthy color. Humus is also gentle on young plants, because it’s easy for their roots to burrow through. A compost pile is one of the oldest ways to make compost. Simply stack together branches, twigs, grass clippings, and kitchen scraps in a clearing in your yard. Every couple weeks, take a spade or pitchfork and stir the contents together. Fresh ingredients can be stacked on top of the pile, and finished compost will settle to the bottom. Compost trenches offer similar results with lower maintenance. When you have a big pile of kitchen scraps, simply dig a deep hole in the ground and bury the organic waste. A 4-6 foot deep hole is about the right depth. Shallow trenches are also useful, but they can attract unwanted animals like possums, skunks, and rodents. Shallow trenches are also a bad idea in certain areas because they stink. Enclosed composters give a great deal of control over compost and they offer protection from the weather as well as small animals. Compost bins are available in various styles. Tumbling models will aerate the compost for you, while stationary models require turning in the same way that compost piles do. Composting bins can accelerate the decomposition process because they offer insulation and they compress compost ingredients into a small space where the heat that bacteria produce will build up. Finally, when the compost is finished, enclosed composters make it easy to transport humus by rolling or pushing the bin to the spot where it’s needed. 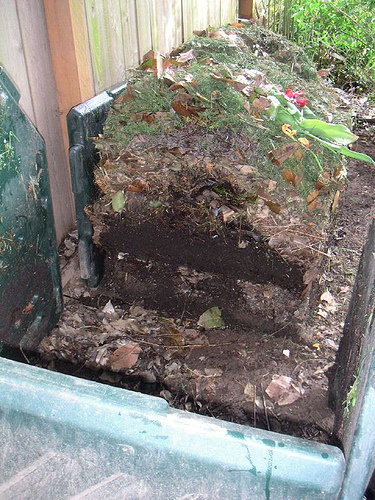 Vermicomposting bins are a unique variation on compost bins. They use small animals such as worms or grubs to break compost down into soil. As the animals eat scraps, they will digest them into soil and use the energy to breed. No matter which method you choose to produce compost, this natural fertilizer is a great alternative to chemical fertilizer. By composting organic waste, you can make your slice of the world a healthier, more natural place to live! Photo courtesy of duckiemonster at Flickr.com.